Right now, you can go into the 3DS’s eShop and download Pokémon Rumble World, free of charge. While the price tag is pretty enticing, I’ve spent some of today playing it, and well...I’m not super impressed. The premise is straightforward: a king tasks you with catching them all, because it’s the only way he can show up an evil wizard. Yeah—the game is pretty goofy, but the tone fits Pokémon just fine. To this end, you can travel to distant lands using a hot air balloon. Each area houses different kinds of Pokémon, all of which you have to defeat and capture. The game starts you off with a Pikachu that can use the move “Thunder Shock” by simply pressing the A button. Using this move, you go out into small arenas full of Pokémon that you can battle with, including end-of-the-level bosses. If you whittle down an enemy Pokémon’s health bar, they will either produce coins which you can use to purchase items, or you’ll be able to add that Pokémon to your team. This is where the bulk of the strategy in Rumble World lies: by capturing different Pokémon, your compendium increases. You are then able to pause the game and swap in different monsters that you’ve captured. Unlike the main Pokémon games, you can carry way more than six Pokemon at a time. And even if you’ve captured the same Pokemon multiple times, each Pokémon is distinct when it comes to moves and health. Playing well in Rumble means knowing when to go in for the attack, when to kite, and when to swap Pokémon for effect. Like most Pokémon games, every creature has its own affinities and weaknesses, which you can use to your advantage. Pikachu for example is pretty effective against water Pokémon thanks to its electric moves. 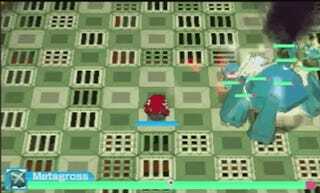 Best of all, moves will often times have specific effects—Makuhita for example can use the move “Fake Out” to flinch enemies. Moving your character throughout levels is pretty exciting—everyone is cutely rendered in 3D, and Rumble World has more of an action vibe than the main Pokémon games. At first, this set-up is fun and more gratifying than the slow turn-based battles of major Pokémon games. But it doesn’t take long for the game to feel like a repetitive button-masher. Worse, sometimes the game auto-attacks for you. It’s design choice that kind of flattens the game. While I do appreciate that the game incorporates many core ideas of the main franchise, knowing what all the weaknesses and strengths for different Pokémon are going makes the game feel like a mindless cakewalk. Yes, there are microtransactions. Visiting new locations/stages costs Poke-Diamonds, which you can either earn through play, or you can purchase them. You can always revisit older locations, but after a couple of visits, your hot air balloon will be out of commission for a little bit. You then have two options: you can either wait, or you can spend money to keep playing. You can also invite a friend to help you out. At first, this made me cynical—forcing me to either wait or pay up is pretty much never a welcome gameplay mechanic. But truthfully, it’s difficult for me to be critical of Rumble World’s free-to-play trappings, because it’s just not the sort of game I’d want to spend time playing. Outside of playing it for coverage, I can’t picture a situation where I play the game so much that I find myself frustrated that it doesn’t simply let me keep going. The game feels like a chore. I do feel guilty saying that, especially considering that trying the game is free, and I can easily see people playing through it without ever spending a dime. I also recognize that Rumble World can potentially provide a distraction for someone who likes Pokémon, especially as we wait for new main games. Finally, I can’t shake the feeling that maybe the game isn’t meant for me, and that a younger kid would get a kick out of Rumble World—hence the mechanics that make it difficult to fail. But if we’re being honest, I personally didn’t find much to like in Rumble World. That said, between this, Pokémon Shuffle, and Rusty’s Real Deal Baseball, the 3DS is starting to develop a wider library of free games. That’s a great thing! I just wish more of these games felt exciting to play, and not like the typical schlock you get with mobile free-to-play games.